Address an older person as Mr or Mrs until they give you permission to refer to them by their first name. Welcome to Sharon’s podcast, Minding Your Manners. Prepare for the Next Office Get-together. Everything from hostess gifts to handshakes is covered in this Holiday Party etiquette podcast. How to Handle the Death of a Business Associate. Sharon equips you to react in a sensitive manner to the death of a business associate, co-worker or a co-worker’s loved one. Networking Best Practices Do you know how to tactfully break in and out of on-going conversations? Networking Best Practices Do you know how to tactfully break in and out of on-going conversations? Let Sharon equip you to tactfully join a conversation at your next networking event. Oops, you're browser can't play this file. Here's a direct link to the mp3: Networking Best Practices Do you know how to tactfully break in and out of on-going conversations? Are Etiquette Rules Different in Social and Business Settings? Oops, you're browser can't play this file. Here's a direct link to the mp3: Are Etiquette Rules Different in Social and Business Settings? Tips for Remembering Names. Repetition is the key to remember the name of a co-worker or business associate. Listen to Etiquette Expert Sharon Hill’s tips on remembering a name. Is Gum Chewing Inappropriate? There are times gum chewing is appropriate behavior, and times it definitely is not. Learn the difference and sharpen your etiquette tools, listen now. Oops, you're browser can't play this file. Here's a direct link to the mp3: Is Gum Chewing Inappropriate? 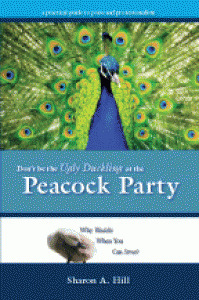 Don't be an ugly duckling! Sharon Hill can help you become an expert at making amazing first impressions with her interactive business etiquette training sessions, presentations, podcasts, and books. Listen in as Sharon tells you how you should treat your wait staff. Passing the salt on its own? For shame! Listen in to learn proper etiquette protocol for passing table seasoning. Ever wonder what the proper way to thank a dinner host is? Listen in to this podcast as Sharon explains the one essential step to showing your gratitude and professionalism. Make a good impression on your dinner partners by not making one on the tablecloth. Listen in for some tips on how to keep it clean. So you're dining out with friends or business associates, and you realize you've got food stuck in your teeth. What do you do now? Listen in to find out. In this quick tip, Sharon reveals the secret of signaling to your server that you've finished your meal. Often, upscale dining establishments will provide you with sorbet as a pallet cleanser. Listen in to learn how not to commit an etiquette no-no when you're served this treat. Where should you pin that name tag when you're at a networking function? Listen in to find out which side and how high. Ever call someone by the wrong name in a formal conversation? It happens to the best of us. Here's how to remedy that little faux pas - and make sure it doesn't happen again. How should you address someone older than you in a formal conversation? Listen in to find out what's acceptable and what isn't in the world of professional name calling. Ever find yourself fearing for your half finished meal when you have to briefly leave the table? Fear no more! In this quick tip, Sharon will educate you on the proper protocol for using your napkin to signal to your waiter or waitress that you aren't done yet. Gentlemen: unsure about the proper way to keep that tie from interfering during a formal meal? In this quick tip, Sharon tells you how to properly avoid wearing your soup. How can you get the most productivity out of your business meetings? Listen in to learn the best practices for effective scheduling. You are always being watched, so learn how not to make a faux pas when dining in a fine establishment. Once again, Sharon shares her etiquette tips on the Richard Brown Radio Show. The Richard Brown Show is a weekly radio show where they discuss, explore and change issues that are affecting the African American community. When is it appropriate to give a gift if you are visiting someone? Listen in to learn more about giving gifts at dinner parties and events. If there are endless buffets at a networking event, what should you do? Listen in to learn a quick tip on eating at networking events. Have you ever been at a party and looked around at other people's plates before cutting into your steak? In this tip, Sharon advises on the proper way to cut your food at the dinner table. What should you do if you are expecting an important phone call at a formal event? Sharon Hill advises on what to do with your cell phone at formal meals so you do not disturb other people. This tip gives you a brief overview about how to present your business cards to people when you meet them. Listen in to learn more about making a great first impression. What should you do if you are about to finish eating your dinner and there are only a few peas left on the plate? Listen in to find out about how etiquette trainer Sharon Hill clears her plate in an appropriate manner. Here is a etiquette tip about networking events. How do you get people to like you based on a first impression? Use the 80/20 rule. Here is a etiquette tip about networking events. How much time should you spend with people at these events? Listen in to learn more. Sharon A. Hill goes on radio show, Marilyn's Cafe Society, to talk about her company and work as an Etiquette Expert. Marilyn's Cafe Society is broadcast out of Joliet, Illinois. Did you know that many CEOs and hiring managers are conducting interviews over a meal? This is often done to see how a potential candidate performs in these situations. The following tips could help you win the job you are seeking. Be poised and professional whether dining at a dinner party or a restaurant... remember that there is no waiter to serve you at someone's home, so the rules will change. Learn the rules of dinner party etiquette. Have you ever wondered if the person in front of you in the buffet line was behaving properly? After listening to this podcast, you will know the ins and outs of how to act when dining at a buffet. Every conversation you have is an opportunity for you to show how polished you are… even on the telephone. Learn how to make a positive first impression on your next phone call with the tips in this podcast. Have you ever had someone shake your hand in a way that made you uncomfortable? This podcast will help you deal with those situations and will give you tips to keep your handshakes polished and professional. Have you ever had to introduce someone, but you couldn't remember his or her name? What do you do when this happens? Sharon Hill International presents key tips to help you feel confident while making introductions. Meeting new people isn't always easy. In fact, introducing yourself to a stranger can be quite daunting for some people. This podcast will help you discover how to instigate small talk, so you appear polished and professional. Sending emails has become so common place that many of us have forgotten that there is a modicum of decorum to be followed. How do your emails compare? One of the most important aspects of communicating professionally is knowing how to maintain proper eye contact. But what do you do if the person to whom you are speaking can't seem to keep his or her eyes on you during your conversation?